There was a castle made of water. It had ten walls, one inside the other, all made of water. The floors inside the castle were also made of water. This castle also had trees and fruit, all made of water. It goes without saying how beautiful this castle was, and how unusual. A castle of water is certainly something wonderful and unusual. 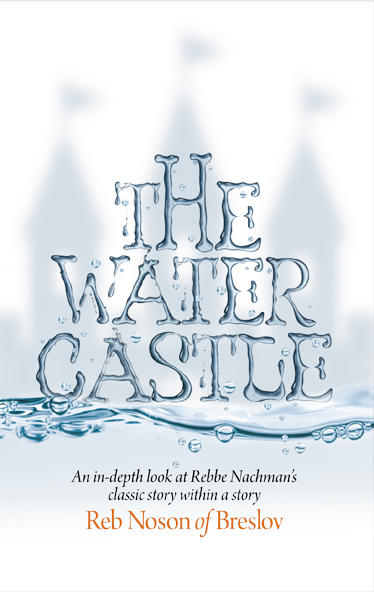 The Water Castle: An in-depth look at Rebbe Nachman’s classic story within a story, translated by Dovid Sears, is a thoughtful, in places lyrical, translation of the commentary of Reb Noson, Rebbe Nachman’s leading student. 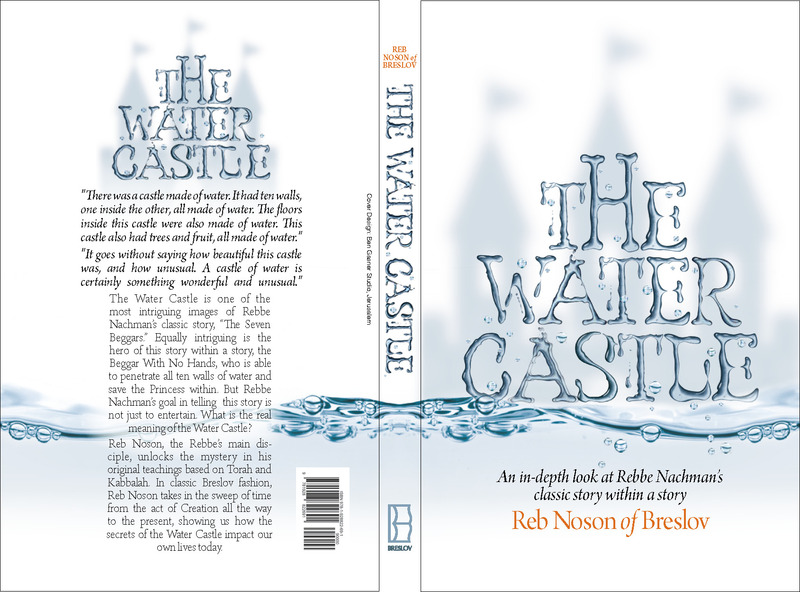 Reb Nosson gives soul-stirring insights into The Water Castle, which is part of a larger story, The Seven Beggars. The Seven Beggars is a tale of two orphans, a boy and girl, who are introduced to the listener after they’ve survived a series of tumultuous events, which have upturned a kingdom, created a wave of atheism among the royalty and nobles, and spawned a flood of refugees. The little children are hungry and lost in the woods, where they encounter, one after another, seven beggars, each with a variety of disabilities such as a hunched back or no feet. Each beggar gives the orphans bread and blesses them that they should become like him. Eventually the children arrive in a town where the beggars also are staying. They hit upon the idea of marrying the boy and girl to each other and the festivities begin. At the *first wedding feast, the bride and groom yearn for the first beggar to come to the wedding. The first beggar, who is blind, arrives, and blesses them. He then shares with them a mystical story. At the second feast, the second beggar is yearned for and arrives, blesses them, and tells another powerful tale. At each subsequent wedding feast another handicapped beggar arrives, blesses the newlyweds and tells them a story, until finally it is the sixth day. And here Rabbi Sears begins. On the sixth day the beggar with no hands is yearned for, and arrives. He tells a tale, which begins with a time when he was sitting with a group of men who were bragging about the power in their hands. He explains that he is able to do that which these men, with their powerful hands, cannot. The beggar with no hands then goes on to tell the bragging men the story of a king who loved a princess, who ended up hating him, and how she ran away to the Water Castle. Each of the braggarts tells of the special powers in his hands (one had the power of charity in his hands, another the power of wisdom, and so on). The beggar with no hands explains how each of the men’s powers, however, was incomplete, and how not one of them would be able to save the Queens’ daughter. He tells them the story of the king who loved the princess once, but he dreamed that she killed him and his love began to fade away. The princess’ love also began to fade, and she ran away. The run-away princess, who represents the soul of the children of Israel, was shot by the king’s ten poison arrows, which causes her to fall down in a faint. And, only the beggar with no hands can save her. The beggar with no hands is able to heal her because only he has knowledge of the ten kinds of charity, the ten types of melodies, and the ten pulses. And save her, he does. At the end of the beggar’s story there was great rejoicing at the orphan’s wedding. In Sichos HaRan, Reb Nosson tells us that “the secret of this story is hidden from all worlds. Yet, every person is permitted to search and probe into it for any hints that he can find as to its meaning…” Rabbi Sears responds by mounting his own search for understanding while translating parts of Reb Nosson’s Likutey Halachos, which reveals of many of the story’s secrets. Rabbi Sears original commentary complements, and in places, elucidates, Reb Nosson’s original text in light of the story, and he also explains the corresponding sections of Likutey Mohoran. Symbols shed their two-dimensionality and the adventure of understanding is made easier by Rabbi Sears’s commentary. We learn the Water Castle may be likened to an (spiritual) edifice of Jewish spiritual growth via Torah’s wisdom, as Torah is likened to water, while revealing the flaws in understanding the Water Castle’s nature of non-duality as license to ignore it’s real, though unifying, boundaries. The princess is cured through the ten types of melody, which are, in essence, joy. And other themes, such as charity, the number ten, and Creation become apparent. Another feature of The Water Castle, which I found to be invaluable, was the format; the Hebrew original and Rabbi Sears’ powerful English translation are on facing pages. Even with a rudimentary understanding of Hebrew, this format seems to enhance the emotional connection the reader has to Reb Nosson and Breslov Chassidus—and it also lends appreciation of the beauty of Rabbi Sears’ language. Although perhaps not for everyone just starting out in their exploration of Breslov, curious readers who appreciate scholarship and spiritual discovery both, will find much to delight in as they are led on a trek though the secrets of Creation to the Redemption, and the corresponding journey of each individual soul. If you have some moderate knowledge of Breslov Chassidus (and if you’re a dedicated learner, even if you may be new to Breslov, Breslov Research Institute is offering BreslovWoman.org readers a ten percent discount on this new release, just enter the code breslovwoman at checkout. *Jewish weddings traditionally have sheva brachos, seven feasts of blessing, each feast held on a different day. There is often entertainment by a badchan (a jester or minstrel) at the wedding itself and sometimes during the feasts of the seven blessings.